Nikon entered the high-end consumer market for an integrated autofocus (AF) and motorized film advance 35mm film SLR with the introduction of the F501 (N2020 in the US) in 1986. 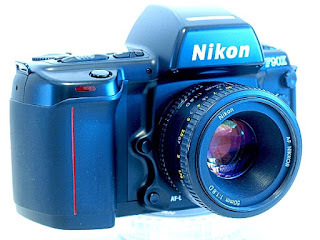 Though able to accepts Nikon's F-mount lenses, the F501 but will only autofocus with 'AF' lenses and fully automatic exposure will only work with AI-S type lenses. The F501 was replaced by the much-improved F-801 (N8008 in the US) in the late '80s, which proved to be reliable and durable, as expected of the pedigree. 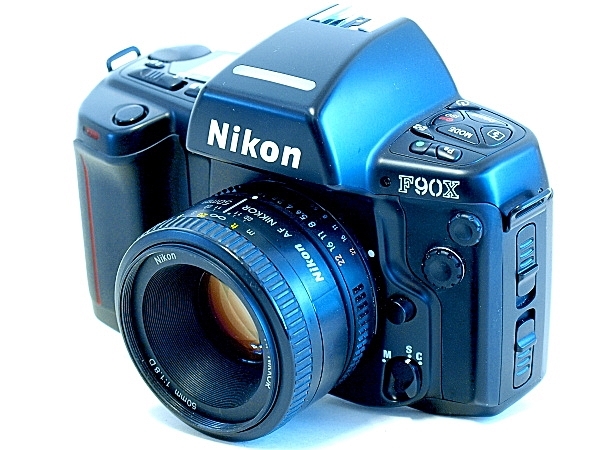 Next came the F90 (N90 in the US), manufactured between 1992 and 2001, noted is its fast autofocus speed (when compared to previous Nikon models) which was driven by an integrated motor unit. Built to a high-quality standard, the F90 were (and are still) used by many professionals. 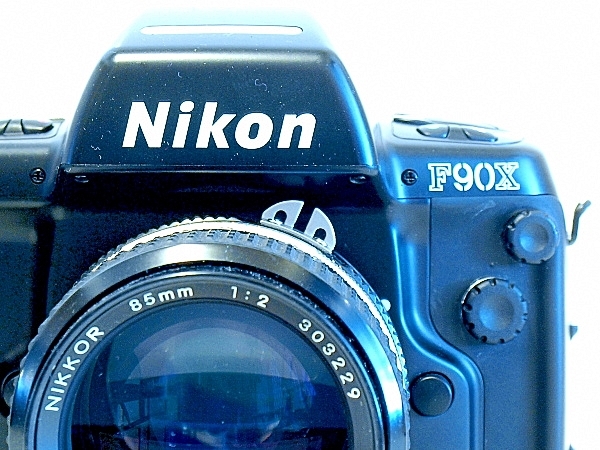 A review of the Nikon N90s. Get your Nik-on! 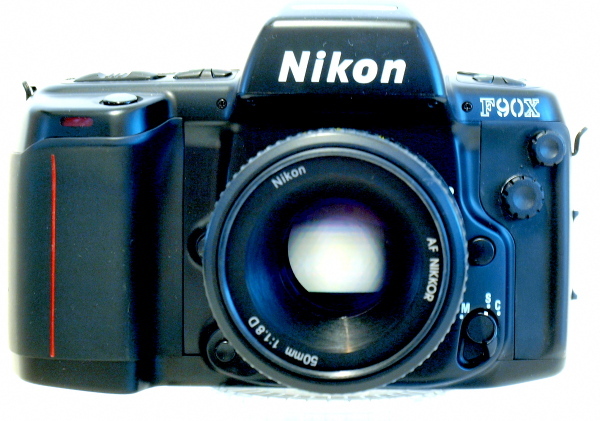 The high point of this series of Nikon's AF cameras was, however, the F90X (N90s in the US), launched in 1994 to replace the F90. Differences between the two models include a faster and more accurate autofocus, even in low light conditions. Shutter speed adjustments in thirds of a stop, increased frame rate, and better weather sealing, among others. The beeping function of the F90 was also removed from this model. The F90X / N90s was then the newest, best and most expensive amateur 35mm SLRs of all time. Build quality is exceptional, and the F90X comes with a tough metallic chassis, under the rubber grip and industrial strength plastic cover. Easily available at low and currently reasonable prices on auction sites, the F90X / N90s will make a great camera for someone looking to get back into film, or for the enthusiast who wants to see how his set of AF-S lenses performs with film cameras. Though being almost identical to its predecessor (F90), the F90X / N90s has better weather sealing, 1/3 stop changes in shutter speed instead of 1/2 on the F90, faster continuous frame rate (4.5FPS), and faster autofocus performance with the cross-type AF sensor and upgrading of the bodies autofocus motor. Liberal with the use of plastic, the F90's are actually built on a tough stainless-steel lens mount and rugged internals. 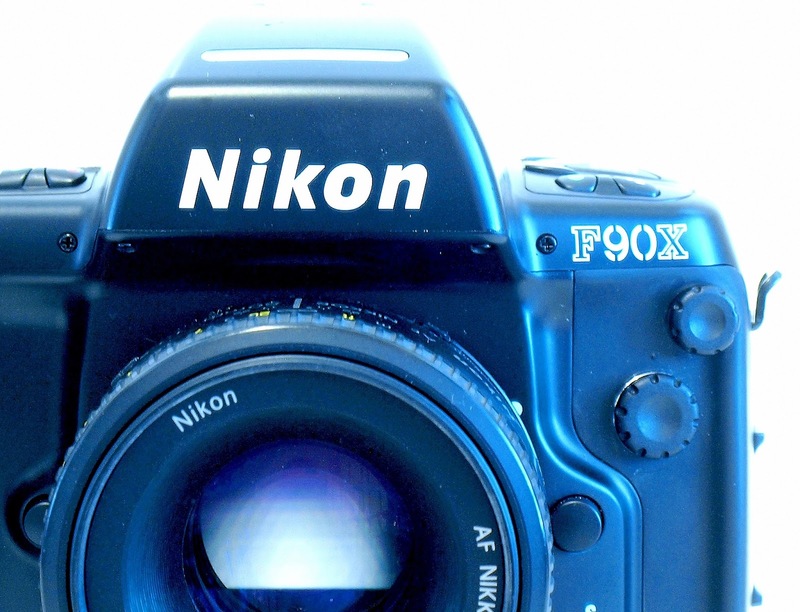 Production of the F90X / N90s, which was then already replaced by the F100, ended in 2001, shortly after the release of the D1 digitals, whose line includes the D100, D200, D300(s) and D700. 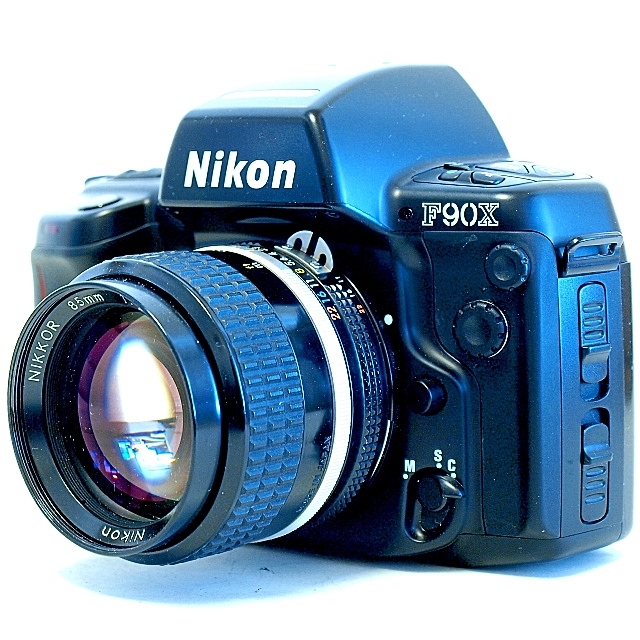 The F90X was also the last consumer/semi-pro camera to be made in Japan, after which, manufacturing was moved to Thailand, where production started off with the F100. Except for the rubberized film back, which is the bane of the F90's, the build quality of the F90X / N90s is exceptional. The F90X / N90s comes with a number of seals that protects the camera from dust and moisture, which is good enough for a spatter of light rain. The film door is secured with two squeeze tabs (see image above) which must be pressed at the same time to deactivate the door lock mechanism. Opening the door accidentally seems rather impossible. Another bonus point for the camera is in its use of AA batteries. Once the camera is loaded with the four it requires, you are all set to go. Weight wise, the F90X / N90s is probably on par with current enthusiast model DSLRs which comes with a battery pack. While it may take a while for you to get used to all the buttons on the top plate, they all point to a functional and logical layout. and on the back, the AE-L (Automatic Exposure Lock), the shutter blind lever switch, and one for turning on the backlight for the top LCD, which emits a distinct hum when activated. The top of the camera has a 4 button control pad on the left for Mode (Program, Shutter Priority, Aperture Priority and Manual), ISO (When DX-coded film is loaded the camera automatically sets the ISO rating), Flash mode (there is no built-in flash), and the Drive mode (continuous or single frame) selection. The button on the top left side controls the program modes, and the button with the green dot is used in combination with the green button on the right to set the camera back to default settings. On the right is a control dial, the ON/OFF switch, exposure compensation (+/-) toggle, one of the film rewind buttons), the AF zone (Wide or circle) button, and last but not least, the shutter release. Film rewind is activated by pressing both the ISO and the film rewind button (on the right side of the top plate) simultaneously. The LCD panel on the right side of the body is the command control, telling you all your shooting information, such as how many shots you have taken (taken, not number remaining), shutter speed, aperture, metering mode, and flash settings. 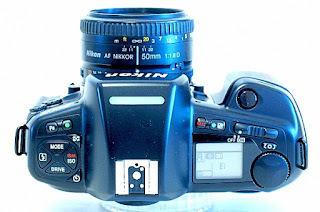 A large, clear and bright viewfinder (92% coverage with a 50mm lens) provides for focusing and metering aids while shooting information, much like what the LCD panel display, is on a horizontal data panel located just below the view frame. The camera is rock solid, the grip is comfortable, the shutter is smooth, and with the AF Nikkor 50mm 1:1.8 D fitted (the only AF lens I have at the moment), which does not add much more to the overall weight, the camera was a delight to use. 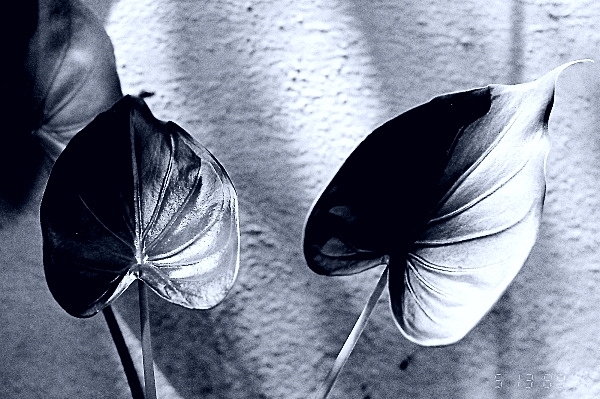 Had a couple of instances where the AF fails to focus on closeup low contrast situations. 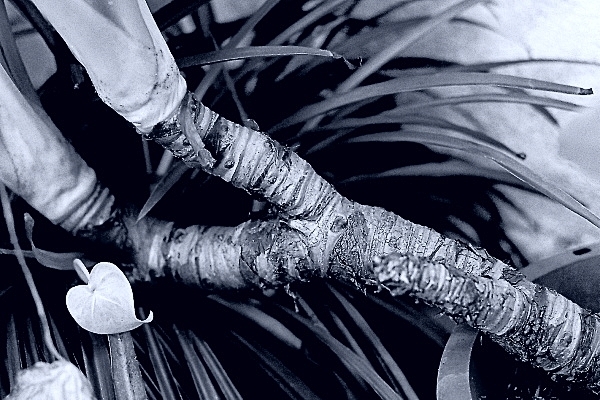 Switching the autofocus mode from Wide Area to Spot AF helps alleviate the problem. Other than that, the F90X is fast, the autofocus accurate, and the AF motor, squeaky. 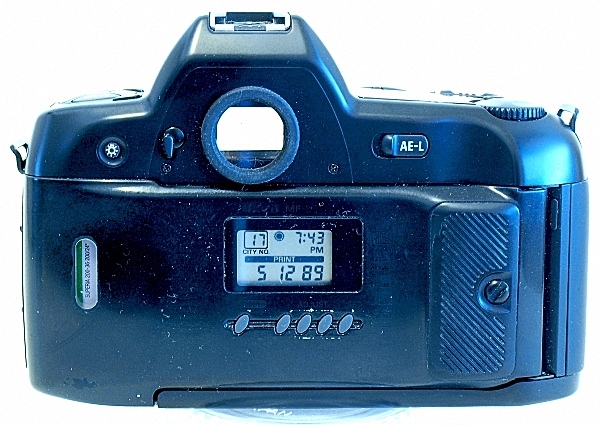 Film advance whirr, which is common on other automatic AF's, is so fast that it is hardly noticeable on this camera. Using the F90X with manual focus lenses, with the electronic rangefinder focusing aid, needs a bit of getting used to. I had the Nikkor 85mm 1:2 fitted for the test. With the huge and bright viewfinder, but with the focus indicator located on the lower left corner of the display, you do have to move your eyes around a bit to take in both the framing of your subject and the focus indicator status. 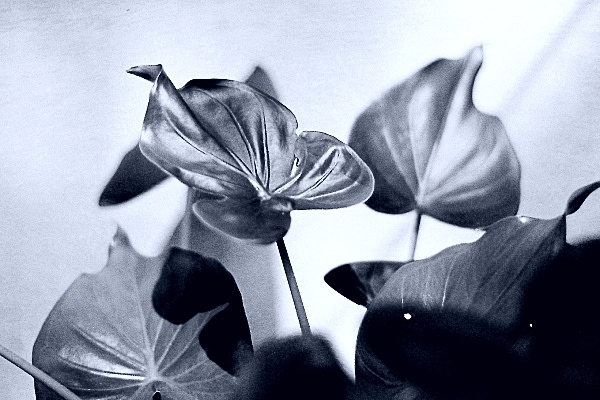 The camera weighs slightly heavier with the lens attached. It is still manageable though as you rest the camera in the cup of your left hand with the thumb and index finger on the focus ring. There are lots more to the camera than what is covered here. Being closer to older generation SLRs where auto exposure through PASM modes is the best that you will get, the F90X is more complex in what you can do with it. This requires me to go through the instruction manual (pdf from Buktus.org) at least once over, and also a lookup on the Internet for online guides. One worth referring to is the N90s Concise Instructions, from Filmbodies.com. If you are looking for a camera to go into film, or to get back into film, and looking for a quality build body, autofocus speed, ease of use, and one which seems to last forever, the F90X (N90s), is one you should look at. I ended up with the F90X that comes with the MF-25 Back. I did not realize until much later that the back is not of the plain rubberized type (the one which will end up sticky and gooey soon enough), and one which I assume will last me a while longer. With prices that are fairly low (you're in for a surprise here) on the auction sites, picking one up is probably a steal. Compare that to, say, a Nikon F100 (the elated choice) which lists for three to four times as much!